Several community organizations are partnering to maximize resources and help the most people they can with an updated Christmas wishes and hamper program. “We have a very generous community,” said Allison McKee, community outreach coordinator for Claresholm and District Family and Community Support Services. Several organizations including FCSS, the Claresholm Local Press, Claresholm Housing Authority, and Santa’s Gone Loonie are working together to offer a Christmas program for the less fortunate. “It’s going to look similar to what’s been done in the past,” McKee said. New this year is that all applications for hampers will go to FCSS. There will be several options to choose from: food only; food and children’s gifts only; food and adult gifts; or food and family gifts, which include gifts for adults and children. 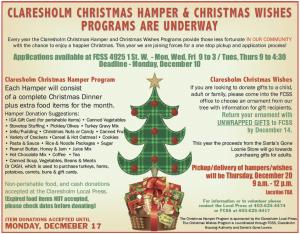 People interested in donating to the Christmas gifts portion of the program can do so at FCSS. They ask that gifts be unwrapped. Proceeds from Santa’s Gone loonie will go towards the purchase of adult gifts. The Local Press alone is looking after the food portion of the program. Donations of cash or food items are being welcomed. Cash donations will be used to purchase turkeys, potatoes, carrots and buns or any of the above items. Each hamper will also include any other donated food items such as cereals; peanut butter; jam; canned soups and vegetables; canned meats such as tuna, chicken, or ham; pastas and sauces; rice dishes; cookies; hot oatmeal; and canned beans. Food items are to be dropped off at the Local Press, and the absolute latest people can drop off food is Monday, Dec. 17. People are also reminded if they are cleaning out their fridges to please check the expiry dates. The hamper program cannot distribute expired food items. Volunteers are welcome to help assemble and deliver the hampers, and can leave their name and number at the Local Press. Volunteers are also needed at FCSS to help wrap gifts.